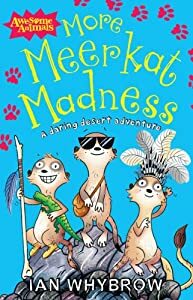 In More Meerkat Madness, Mimi, Skeema, and Little Dream are unhappy when Uncle invites a fluffy stranger to join the Really Mad Mob. So when Little Dream dreams that their missing mama is calling him, the kits set off to search for her. But a lost lion cub has other plans for them. These Meerkats get into more mischief while having their adventures. I have to say that I fell in love with these characters reading the first book in this series, and this book was just as good. I think for my daughter and I it was the characters themselves that we love the most, though the story eas also strong and a lot of fun to read and engage with too. If you have never met these great characters, pick up one of the stories today, you will truly love them!